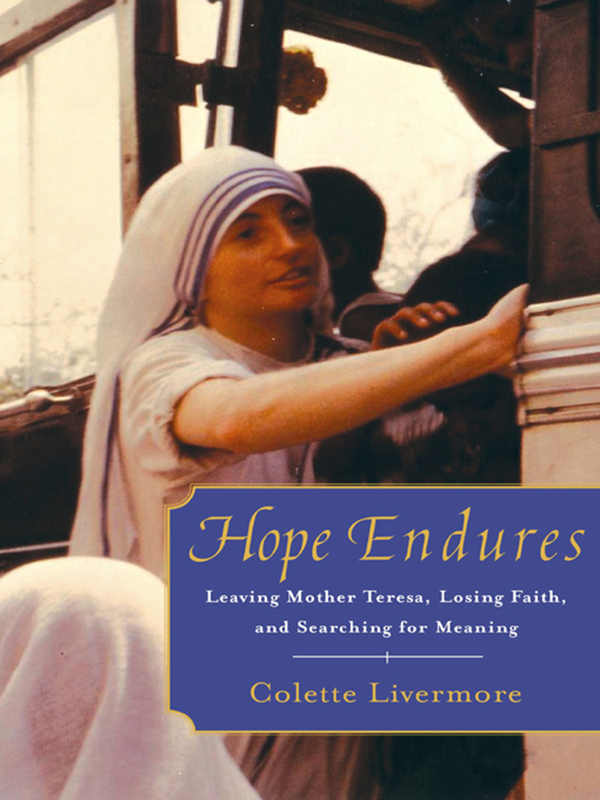 The searing memoir of an extraordinary woman who served as a nun for eleven years in Mother Teresa's order, Hope Endures is a compelling chronicle of idealistic determination, rigid discipline, and shattering disillusionment. InÊher life's journey from certainty to doubt, Colette Livermore enters the Missionaries of Charity order in 1973 with unwavering faith and total surrender ofÊher will and intellect after seeing a documentary on the order's work in India. Only eighteen at the time, Livermore has been studying to enter medical school -- a lifelong goal -- but virtually overnight severs her many ties with family, friends, and the life she's known in beautiful, rural New South Wales in order to train as a sister to aid the poor. In the process, she also gives herself over to the order's unexpectedly severe, ascetic regime, which demands blind obedience and submission. Given the religious name Sister Tobit, Livermore serves in some of the poorest places in the world -- the garbage dump slums of Manila, Papua New Guinea, and Calcutta -- bringing hope and care to people who are desperately ill, hungry, abandoned, and even dying, and comforting whomever she can. Although she draws inspiration and strength from her humanitarian work, Livermore and other nuns risk their own physical health, as they are sent to dangerous areas while being unschooled in the languages and cultures, untrained in medical care, and sometimes unprotected by vaccines. Livermore herself succumbs to bouts of drug-resistant cerebral malaria that almost kill her and to a new strain of hepatitis. Over time she also beginsÊto notice that the order's rigid insistence on unquestioning obedience harms the young sisters mentally, emotionally, and spiritually -- and she experiences a terrible inner struggle to find the right path for herself. As she tries to respond to the suffering around her, she often falls into an incomprehensible conflict between her vow to obey and her vow to serve, between religious strictures and the practice of compassion, between authority and personal conscience. Pressured to stay with the order by Mother Teresa and other superiors, as well as by the younger nuns, Livermore nonetheless decides to leave at age thirty and attain her medical degree, continuing to take health care and relief to impoverished people in remote areas -- the isolated aboriginal communities of the Outback and war-torn East Timor. Even as she serves others as a medical doctor, she continues in a crisis of faith thatÊeventually leads her to become an agnostic. Hope Endures is the eye-opening, deeply affecting story of a brave woman's search for meaning in a world that is rent with tragedies and contradictions. It is also an unflinching critique of any faith that insists on blind obedience. For true hope to endure, Dr. Livermore demonstrates, we must always strive to question, to face the hard truths, and to discover the courage to follow our convictions.